Cancer is the subject of intense research around the world, but many questions about how the disease works remain unanswered. How exactly does cancer start and how do tumours grow? The cancer stem cell theory could explain how some cancers work and why patients suffer relapses. Mutations in genes controlling cell division can cause healthy cells to become cancer cells. But it’s still not clear how cancer cells grow into a tumour. Only some cells in tumours continue to divide and multiply. This observation has led to two theories for how tumours grow. 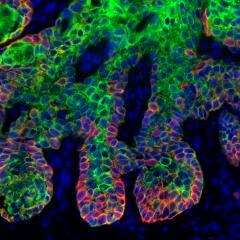 The ‘cancer stem cell model’ proposes that cancer stem cells make all other cells found in a tumour. Some tumour cells may briefly divide, but only cancer stem cells can make new cells indefinitely. The ‘stochastic model’ suggests that many cells in a tumour replicate, differentiate and contribute equally to tumour growth. There are many unknowns about cancer stem cells, including whether they even exist in all types of cancer. There is no definitive proof for one theory or the other yet and it is possible that different types of cancer may follow different theories. Researchers are looking for more direct evidence that cancer stem cells are present in tumours. Researchers are trying to determine which cells become cancer cells. Can any cell become a cancer stem cell or do cancer stem cells come only from mutating genes in natural stem cells? Researchers want to know how different genes, mutations, signals and environments influence how cancer stem cells behave. This is not easy, because studying cancer stem cells often requires isolating the cells in a laboratory, where they may behave differently than inside the body. In the healthy body, some cells can divide to produce new cells. This is a carefully controlled process that allows the body to grow, and to replace lost or damaged cells during adult life. In cancer, cells divide in an uncontrolled way, eventually forming an abnormal mass of cells called a tumour. Cancer cells are out of control because of mutations (changes) in their genes. Mutations accumulate as our cells divide and age, but certain combinations of genetic mutations can lead to cancer. Despite intense research into cancer, it is not clear exactly how tumours grow. Cancers are very often made up of a mixture of different types of cells. Some cells divide repeatedly, while others appear to develop into more mature cell types that no longer divide. There are two main theories to explain this: the cancer stem cell theory and the stochastic model of cancer growth. Cancer theories: The cancer stem cell theory suggests a clear hierarchy of cells within a tumour. 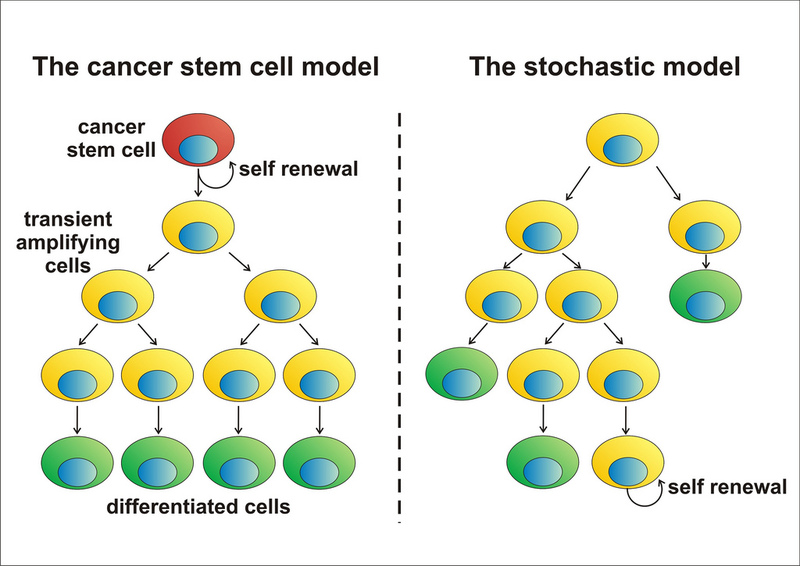 The stochastic model says that tumour growth is a random process to which all cells can contribute. Cancer stem cells that divide and feed tumour growth. These cells can self-renew (copy themselves) extensively, and also produce more mature cells called transit amplifying cells. Transit amplifying cells that divide a certain number of times then differentiate (or 'mature') into specialized tumour cells. Specialised tumour cells that do not divide and so do not contribute to tumour growth. According to this idea, the cells in a tumour are in a strictly organised system with cancer stem cells at the top of the tree, giving rise to all other cancer cells. The stochastic model of cancer growth gives a different possible explanation of tumour growth. This theory argues that all cancer cells have the same potential to grow and divide, but each cell chooses at random between self-renewal and differentiation. The cells in a tumour are not in an organised system – any cell has the same intrinsic potential to contribute to tumour growth. Different types of cancer may work in different ways, so it is possible that both of these theories are right. Perhaps they apply to different cancers or different stages of tumour development. There is no definitive proof in favour of either theory of cancer growth. However, an increasing amount of evidence suggests that the cancer stem cell theory holds true in some cases. The first evidence in favour of cancer stem cells came from studies of human leukaemia. Researchers found that only a subset of leukaemic cells can cause leukaemia when transplanted into a healthy body, the key characteristic of cancer stem cells. Since that discovery, many researchers have found cells with cancer stem cell characteristics in a great variety of human and mouse cancers, including breast, brain, skin, prostate and colonic cancers. In some types of tumour the cancer stem cells are rare, for example in colon cancer. In other types of cancer, such as melanoma, a very large number of the tumour cells have cancer stem cell characteristics. The cancer stem cell theory is controversial because evidence for the existence of cancer stem cells relies solely on experiments that involve breaking down a tumour, taking out particular cells and then transplanting them. This process does not exactly mirror natural cancer growth. To prove that the transplanted cells are really cancer stem cells, scientists will need to look at individual cells and find direct evidence that the cells do indeed feed tumour growth within the natural environment of the body. The cancer stem cell concept has important implications for cancer therapy. If cancer stem cells are responsible for maintaining tumour growth, then eliminating these cells would eventually cure the patient. 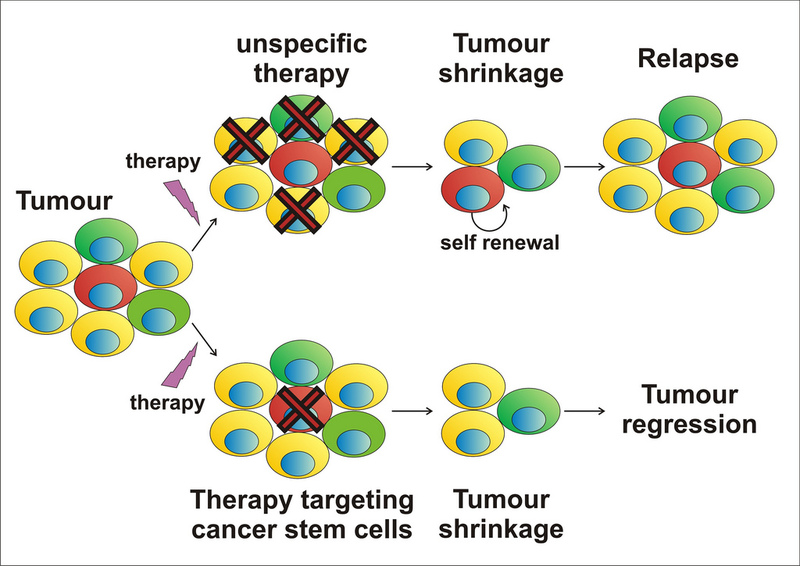 Cancer stem cells and therapy: If a cancer treatment destroys the bulk of a tumour but leaves behind cancer stem cells, then those cancer stem cells can continue to self-renew and can cause the tumour to regrow. It has also been suggested that cancer stem cells are more resistant to chemo- and radiotherapy than other cells in a tumour. This could be one cause of tumour relapse after therapy. Understanding how cancer stem cells resist medical therapy could lead to the development of new, more efficient cancer treatments. Many questions remain to be answered about cancer. More studies are needed to determine precisely how different cancers grow and how they resist medical therapy. Do all tumours contain cancer stem cells? What type of cell is the cell of origin, or starting point, for different cancers? Researchers are also investigating how cancer stem cells are controlled. What genes, proteins or other molecules are involved in their development and behaviour? Does the tumour’s immediate surroundings, or ‘microenvironment’, affect how cancer stem cells behave? The answers to these questions will be important for future cancer treatment strategies. This factsheet was created by Cédric Blanpain. Reviewed and updated in 2015 and 2018 by Cédric Blanpain. Images by Cédric Blanpain, Benjamin Beck, Khalil Kass Youssef and Gaelle Lapouge. There are more than 100 types of cancer. Each starts with a change in just one cell, and some may be driven by out-of-control stem cells. Green marks cells from connective tissue, red marks tumour cells. Benign tumour in mouse skin; green marks cells that are dividing (possible stem cells).